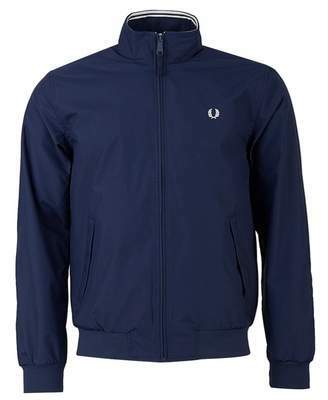 This classic Brentham zip up jacket from Fred Perry is a wardrobe essential. Featuring a full zip fastening, angled welt pockets, a ribbed collar, cuffs and hem. Finished with stripe detail through the edge of the collar and the brand's signature laurel wreath logo embroidered on the left chest. Body/sleeve lining/trim: 100% polyamide Ribbed collar Zip fastening Welt pockets at waist Long sleeved Internal zip pocket Stripe detail on collar Ribbed cuffs and hem Laurel Wreath logo embroidered on chest Machine wash Size and Fit Size photographed: medium Pit to pit: 22"